Succulents are ideal container plants because of their slow growth and low demand for water. Choosing the right pot and the right soil mix can make the difference between a beautiful healthy plant and a sad droopy specimen headed for the trash bin. We’ve all seen little succulents growing in glass containers with differing shades of sand and gravel intricately layered. While these may be beautiful table accents at a wedding or dinner party, plants grown in containers with no drainage are not destined for a long life. Be aware that such displays are temporary. If you do find a container that is perfect for your cactus or succulent but it lacks a drain hole, you can make one yourself using a ceramic drill bit. It is important to keep the surface you are drilling under water. Water will cool the tip of the drill bit. Drill slowly, apply only slight pressure and keep the drill and cord dry. When you finish, put water in the container to make sure it flows out completely. When choosing a container some people prefer unglazed clay to glazed clay. I have found that glazed containers work fine as long as they are filled with fast draining soil mix and they do not sit in puddles. I avoid the containers with a dish attached to the bottom because water remains in the saucer near the roots. Soggy soil is the enemy of succulent plants. It not only is detrimental to root health, it attracts pests such as mealybugs. Your container should complement the plants you are putting in. If you have succulents with variegated leaves a solid color container will show them off. If you have a brightly colored container, plants with plain green leaves may look better. 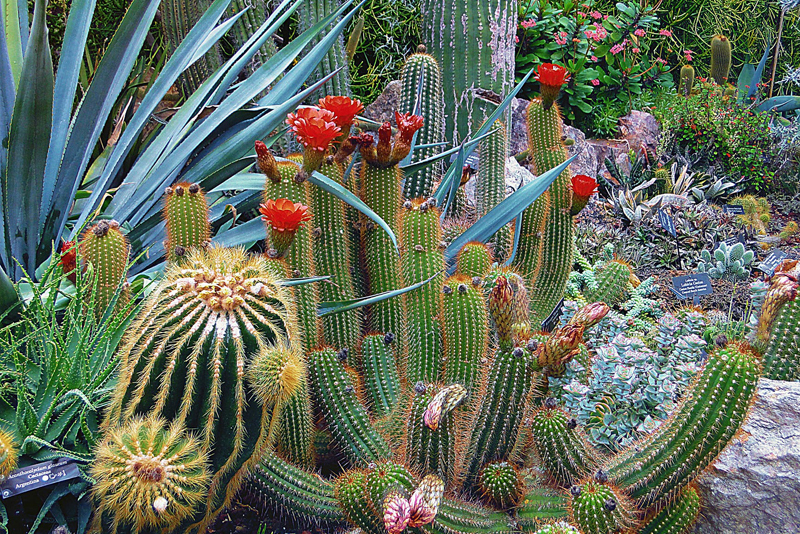 Low cacti will look their best in a low container, while columnar cacti will need a tall pot to balance them out. Choose plants that look good together. Too many different variations can look cluttered. A standard rule of thumb is to choose one plant to be the showpiece, one to hang over the edge of the pot, and one to fill in the gaps - a low growing plant. If you’re looking for containers on a budget, don’t forget about thrift stores. They are a good source for ceramics that you can drill a hole in. 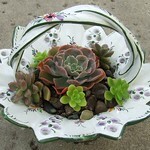 You may also find other interesting objects that can be repurposed for succulent containers. Large seashells, old toasters, anything can be a container if it has drainage.